“Sweet Caroline! Good times never seemed so good! / I’d be inclined, to believe they never would!” Now, I’m not ordinarily a supporter of audience participation, but such was the infectious atmosphere created during an interesting and varied evening that even this stubbornly reticent reviewer couldn’t resist joining the crowd that had risen to their feet for the big finale. Songs in this show were from the Neil Diamond back catalogue, as well as a few other tunes from songwriters who worked in the Brill Building in Manhattan, where much of the American chart music songs of the late Fifties and early Sixties were composed and recorded. There’s even something, I later discovered, called the Brill Building Sound, a music genre for which just some of the numbers in A Beautiful Noise: Celebrating The Music and Life of Neil Diamond come from. Not all of the songs considered to be part of the Brill Building Sound were actually written in the building itself, but the salient point here is that its legacy is long-lasting, and thanks to shows like this, it continues to reach new audiences. Shows of this nature by the likes of Fisher Stevens (also known for Elvis Presley tribute shows) are all the more important now that Diamond no longer tours following a Parkinson’s disease diagnosis (Stevens had arranged for collection buckets to be stationed at the exits to raise money for the charity Parkinson’s UK). 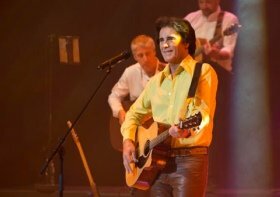 This isn’t just another tribute gig: Stevens does genuinely sound very much like Neil Diamond, and the costumes, movements, mannerisms and facial expressions are all there too. There were some very enthusiastic front row patrons at the performance I attended. Given the talent on stage, fair enough. Flanked by some superb musicians and female backing singers, Stevens enjoyed an excellent rapport with the audience. Some details, through detailed video projections, were given of Diamond’s career, just enough information for those unfamiliar with Neil Diamond to gain a good understanding whilst not forcing Diamond’s substantial fan base to sit through too many facts and anecdotes that they already know. Naturally, maximum benefit is gained by those who already know the words to ‘Forever In Blue Jeans’ or ‘Girl, You’ll Be A Woman Soon’. A lovely memorial to a number of departed singers as Stevens sang ‘He Ain’t Heavy, He’s My Brother’ was a memorable highlight. At some point in the second half, though, the trip down memory lane ceases. Stevens, his singers, his band – and his audience – crank up proceedings by several notches, and what began as a pleasant and subtle concert transforms into a relentlessly joyous and electrifying experience. The on-stage band (seemingly) effortlessly tackled the broad spectrum of the Diamond repertoire – including the reggae-esque ‘Red Red Wine’, the aptly-named patriotic tune ‘America’ and ‘I’m A Believer’ (made famous by The Monkees but composed by Diamond). Stevens’ easy-going nature added extra warmth to a production that felt remarkably intimate even in a West End proscenium arch theatre with all the trimmings. The sound created by both singers and band came across as highly authentic – if one were to listen to a Neil Diamond record, it would sound like this. So why come to see it? Because there’s nothing quite like the live music experience. This was, all things considered, a thoroughly enjoyable evening. A Beautiful Noise? Absolutely. Not a trace of doubt in my mind, so to speak. Award-winning Fisher Stevens makes his West End debut in A Beautiful Noise, a show which celebrates the life and music of Neil Diamond, one of the world’s greatest ever singer-songwriters. Featuring a live band, including a brass section and backing singers, A Beautiful Noise is now the best way for UK audiences to enjoy his wonderful songs in a live theatre setting. Flying Entertainment, producers of the West End concert spectacular, Thriller Live, which celebrates its 10th record-breaking hit year at the Lyric Theatre on January 22nd, 2019, present this lavish new production.